Summer is almost over, and that means it's time for kids to head back to school. 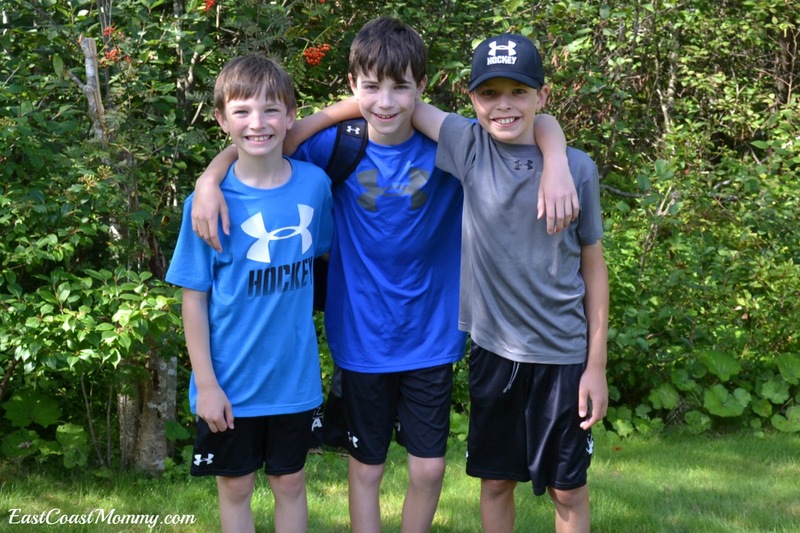 As the mom of three rough and tumble boys who are hard on clothes (and fussy about what they wear), I have learned a lot about smart back to school shopping. 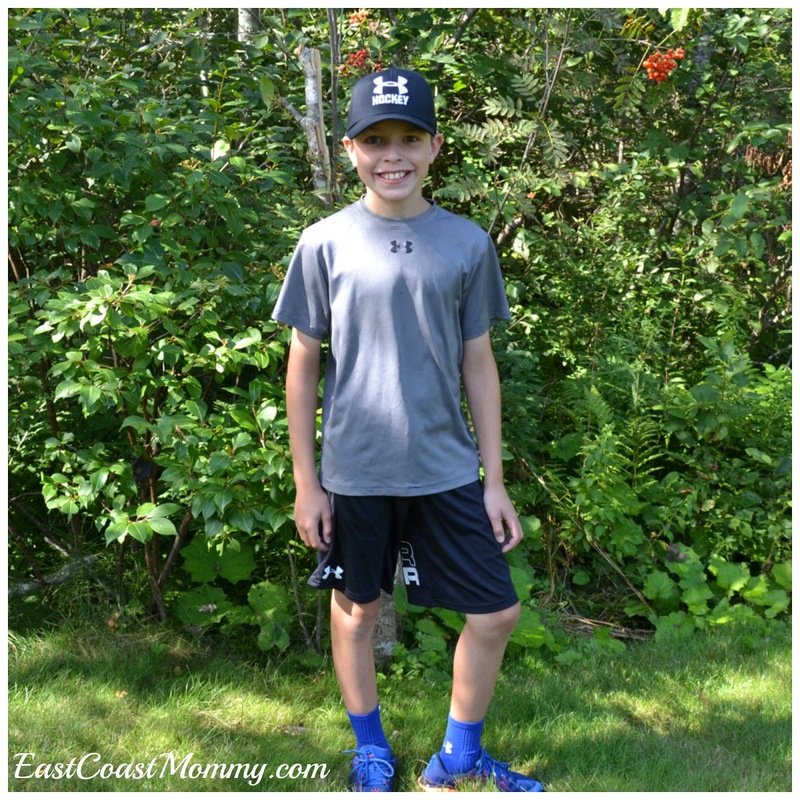 Today I am sharing some of my best tips for back to school clothes shopping with kids. 1) Purge - At the end of summer, get rid of the clothes that the kids don't wear by donating or selling them. Also, make sure drawers only contain items that the children will wear during the current season. 2) Shop early - Back to school clothes should be purchased as early as possible to ensure the best selection of sizes and choices. 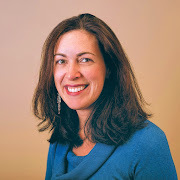 As a mom who needs six pairs of sneakers each Fall (3 pairs of indoor shoes and 3 pairs of outdoor shoes), I've learned that getting organized early really helps to reduce my stress. 3) Involve the kids - If you let the kids help with the selection of their own clothes, you will only be spending money on the clothes that they will actually wear. My boys are fussy about colours, designs, brand names, and textures, so it makes sense to let them help shop for their own clothes. 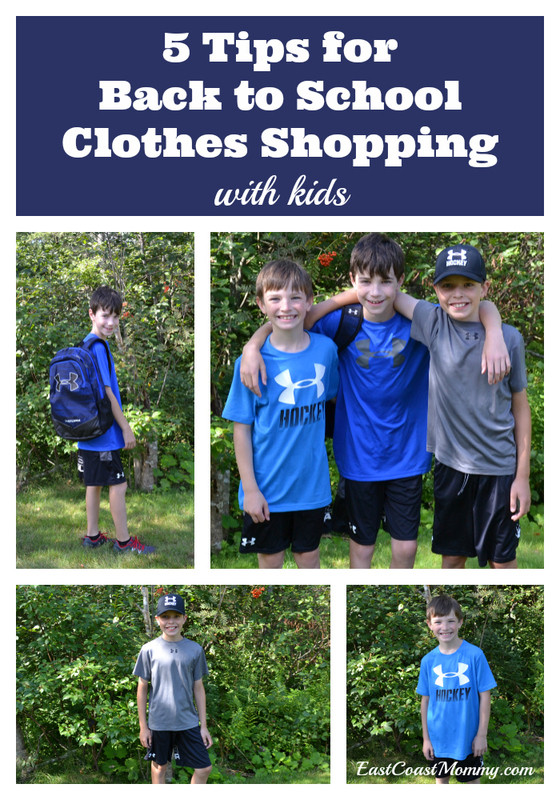 Check out the fantastic items my boys chose when I let them pick out something special at Sport Chek* for the first day of school. My 11 year old loves hats and loves hockey, so I wasn't surprised when he chose this great Under Armour hat. It's high quality, and the size S/M fits his head perfectly! 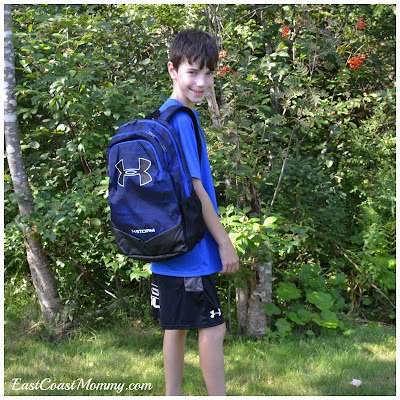 My 9 year old is heading to a new school, and loves to collect (and carry around) "treasures and trinkets", so he was obsessed with getting a new backpack with lots of pockets. He couldn't be more excited about the new Under Armour backpack he picked out! 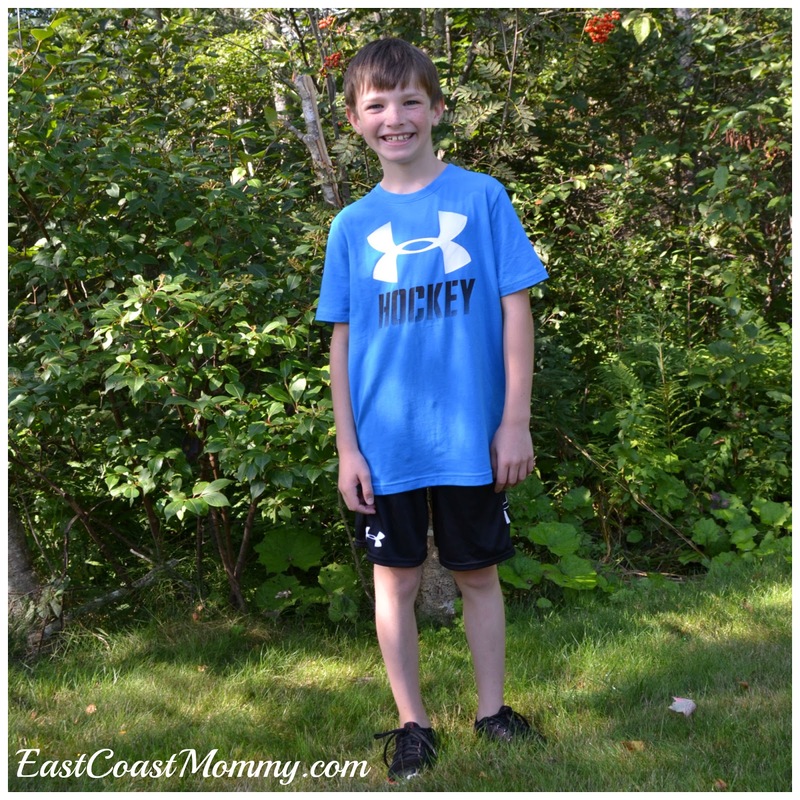 My youngest loves hockey and will only wear soft, comfy clothes. 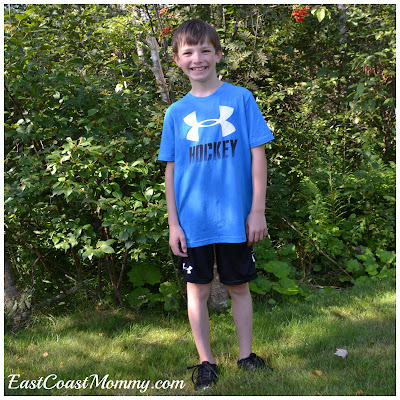 He loves the texture and look of this fantastic Under Armour t-shirt... and I love that it matches his eyes! 4) Shop online - Shopping online allows you to research and shop without leaving the comfort of your home (without dragging your kids "who hate shopping" to the mall). 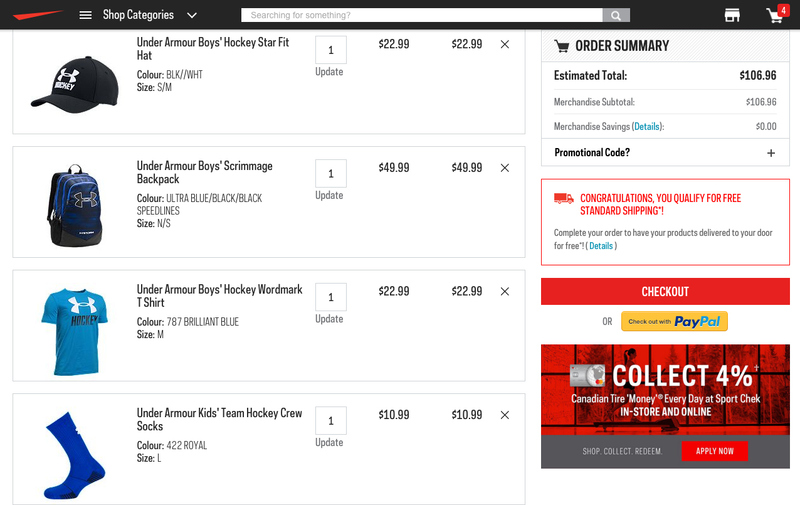 SportChek.ca is a great choice because they have guaranteed footwear sizes, easy returns within 60 days, a large variety of brands, online shopping/research opportunities, and online customer service. There is also free in-store pick and and free shipping on orders of $99 or more. Sport Chek is a convenient one-stop shop. 5) Buy quality clothing and shoes - If you spend a little more on children's clothing, it will last, get worn, and save you money in the long run. I have three boys, and quality clothing gets passed down to younger siblings, and it still looks great. You can also resell brand name clothing on "buy & sell" sites or at consignment shops. My boys are happy and ready for the first day of school! I hope you find my tips helpful, and that you take some time to check out the fantastic, high quality, back to school styles available at your local Sport Chek store or online at SportChek.ca. *Disclosure - I have partnered with YMC and Sport Chek and have received compensation for this post. All opinions in the post are my own. 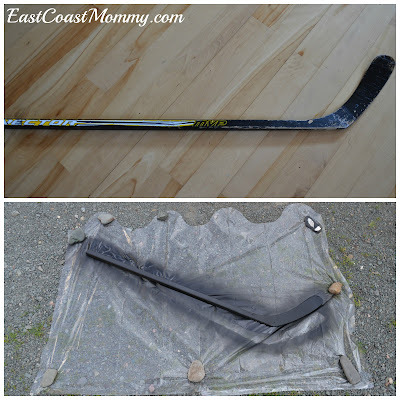 Recently, I was cleaning out my garage, and I came across my boys' first hockey sticks. I am usually pretty good at clearing clutter, but there was a part of me that was sad to think of getting rid of these particular items, so I decided to up-cycle them into decor for their rooms. 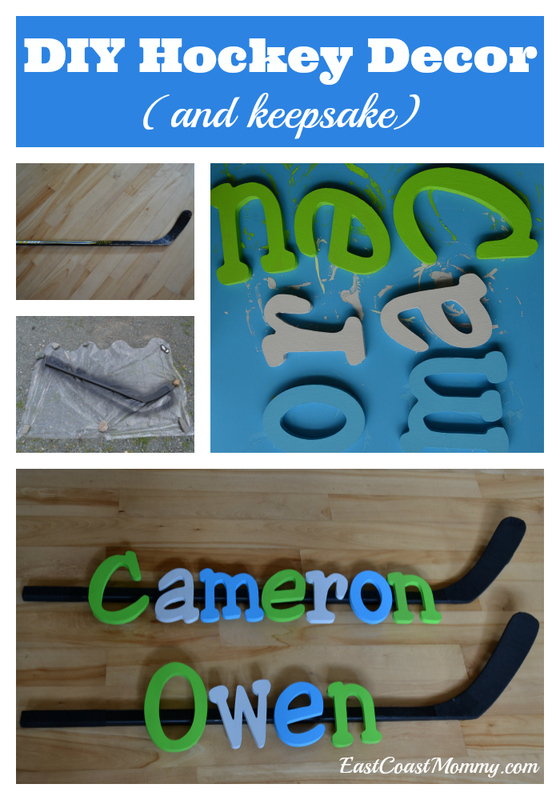 I love the way this project turned out, and today I am sharing all the details of this DIY hockey decor project. I started out with my boys old, banged up sticks. I removed the old hockey tape, spray painted the sticks with black paint, and re-taped the sticks. Then, I painted wood letters (that spelled out their names) in bright and cheerful colours. 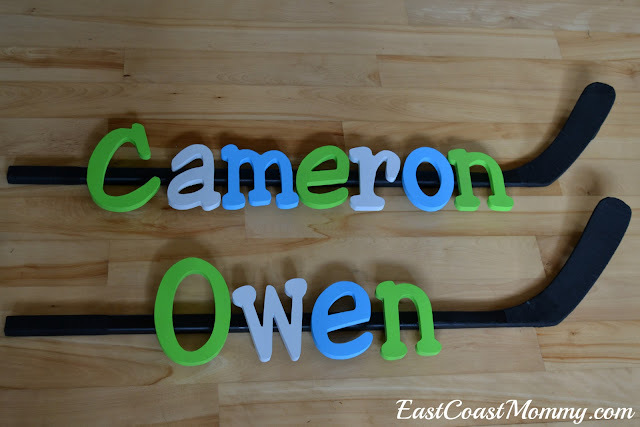 I used hot glue to attached the letters to the stick. Didn't they turn out sweet? 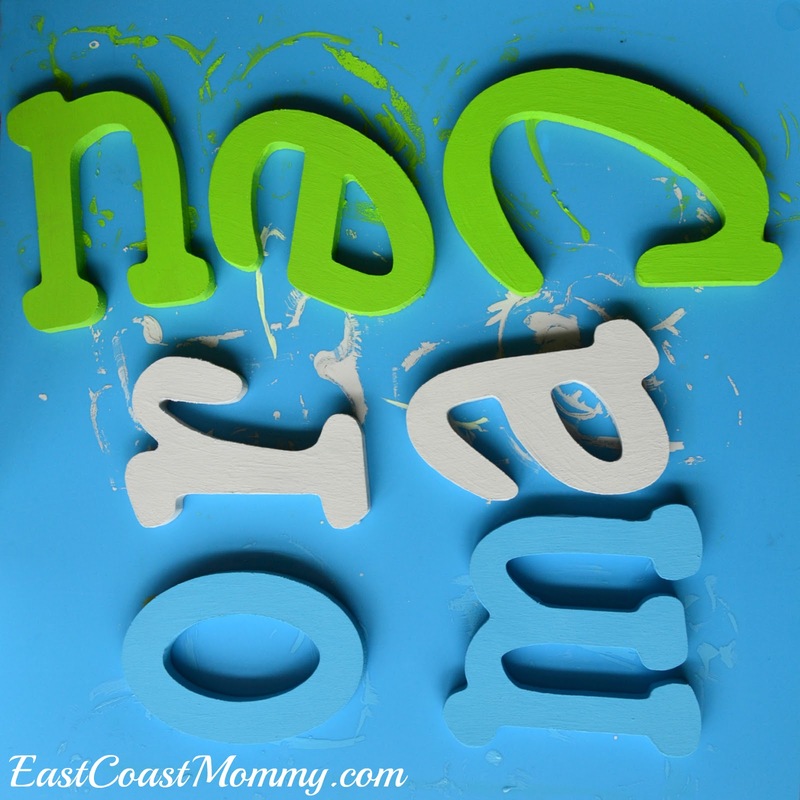 I love that they are room decor AND a precious keepsake. I'm redecorating the room that my two older boys share, and I plan on putting these sticks above their headboards. 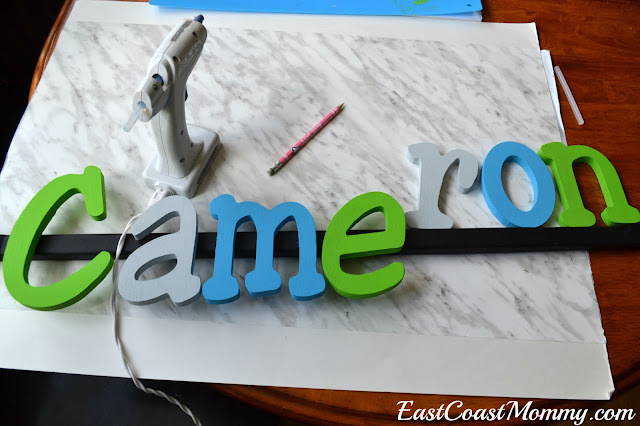 I'll be sharing the big reveal of their new room soon! 1) Careful Selection - When my husband and I first started dating, I convinced him to watch "Terms of Endearment" by telling him it was a comedy. Apparently, it wasn't his kind of movie, and it took years for him to trust my choices again. Lesson learned -- don't try to get your spouse to watch shows that you know he isn't going to like. These days, I am much more careful with my suggestions. Recently, we have found some great selections that we both really enjoy. 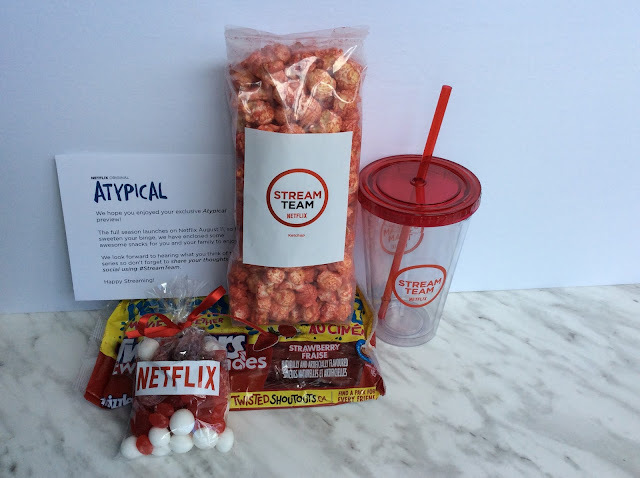 "Atypical" and "Ozark" are our current favourite binge-worthy shows. 2) Trickery/ Positioning - Phrases that work: "I heard this is really good", "This is a lot like that other show you like", "Let's try one episode, and if you don't like it, we won't watch any more." 3) Treats - When all else fails, bribing my husband with tasty sweet treats always works. Wine and chips work well too! 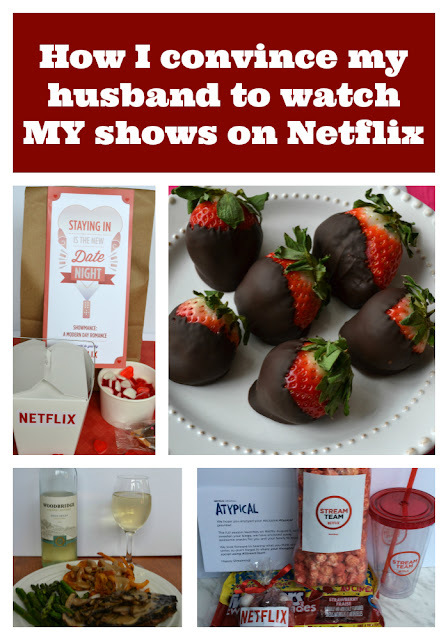 How do you convince your spouse to keep you company on the couch? 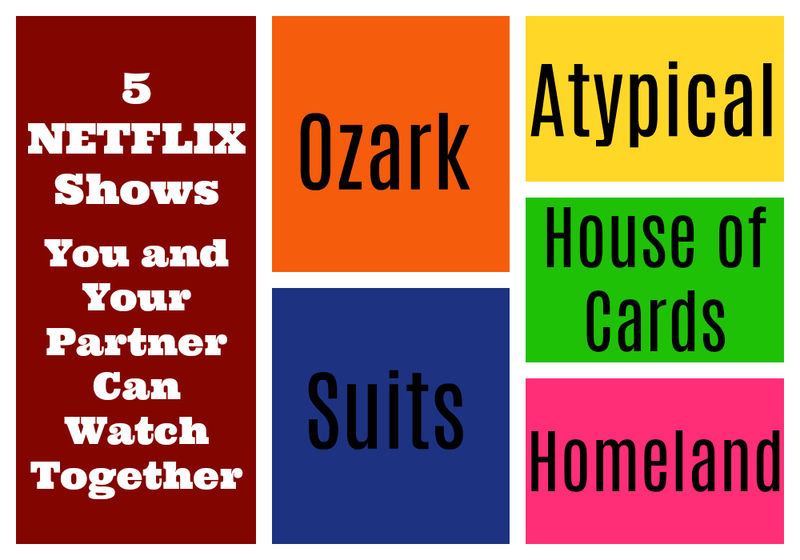 What is your current favourite binge-worthy show? My boys love science, so it's always fun to spend a rainy summer day doing simple science experiments. This year, we decided to make a bouncy egg. 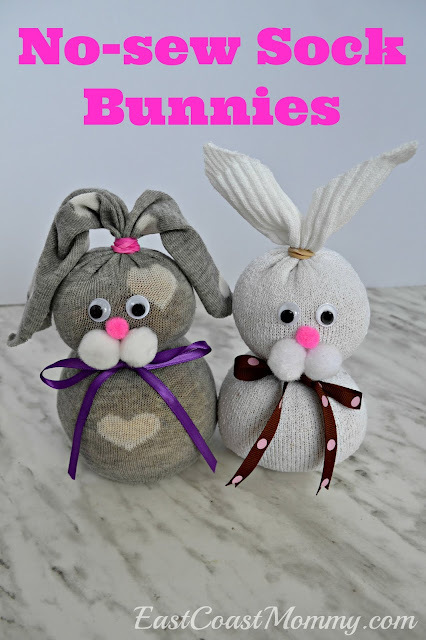 Today, I am sharing the super-simple instructions and the super-cool results! All you need to make a bouncy egg is a glass, an egg, and vinegar. 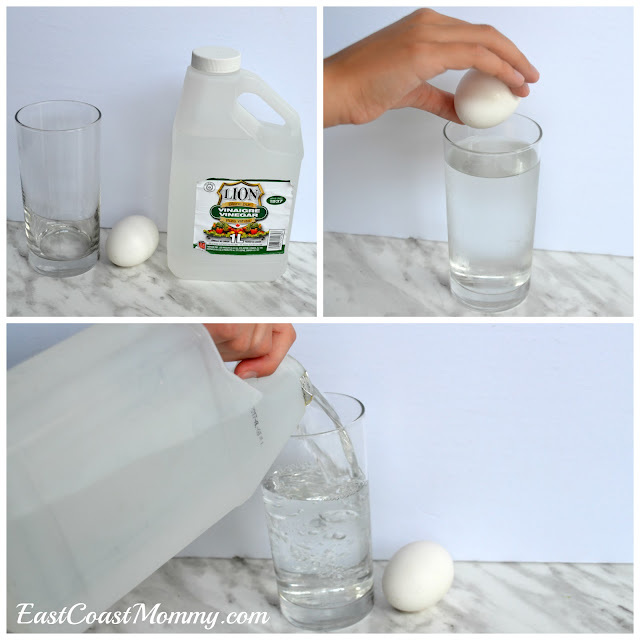 Fill the glass with vinegar, drop in the egg, and wait for the vinegar to dissolve the shell. The process starts immediately, and it will take about 24 hours to complete. 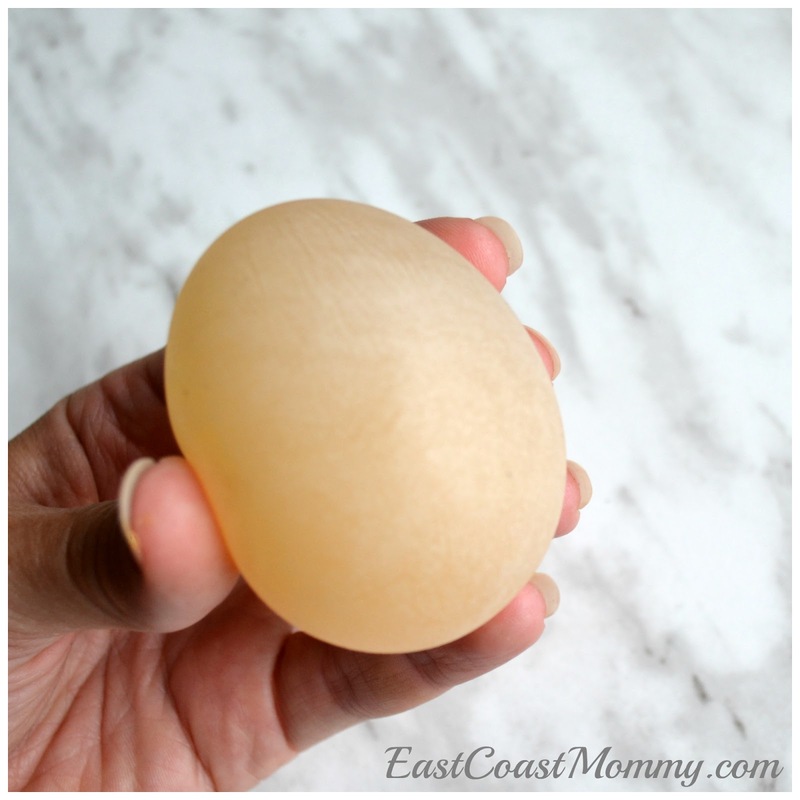 After the 24 hours, rinse the egg in cold water, and dry it off. Children will be amazed by the "rubber" egg they have created. Check out this little video we made to show the show the finished product. 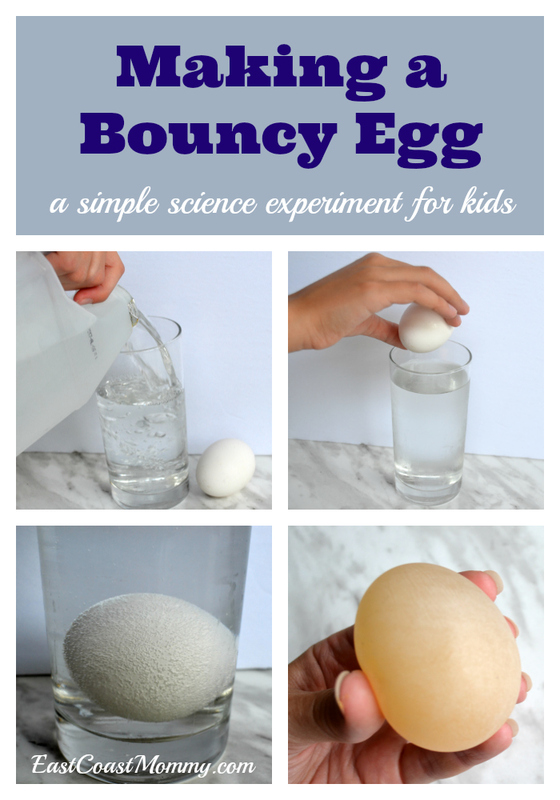 This really is a fun way to explore science with children. My boys loved playing with the bouncy egg, shining a flashlight into it to see the yolk, and poking it with a knife to see the inside. Is there anything better than feeding the curiosity of a young mind? 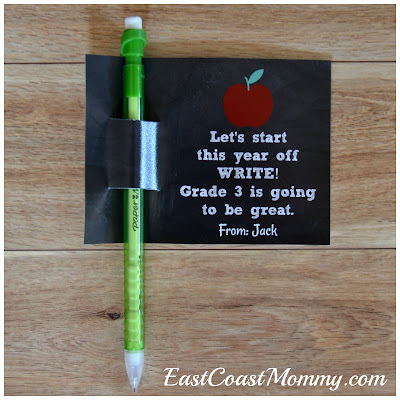 Every year, on the first day of school, my boys bring little treats to share with their new classmates. I think this is a simple way to teach my boys about kindness, giving, and the importance of friendship. 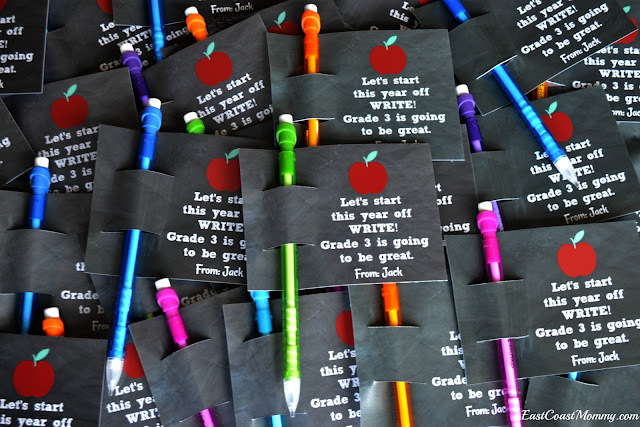 This year, my 8 year old wanted to share some brightly coloured pencils with his friends, and today I am sharing the finished product, and the adorable tags I designed. I designed 4X6 tags in Picmonkey.com, had the tags printed at my local photo lab, and cut the tags in half. Then, cut little slits in the tags and inserted pencils. Cute, right? You can design your own tags, or you can download and print the generic tags I designed. To download these tags for free: right-click on the photo below, save it to your computer, and print it like a regular 4X6 photo. I love how the brightly coloured pencils contrast with the chalkboard tags! I think bringing a little class treat on the first day of school is a wonderful way to start off a new year. The pencils are a fantastic alternative to sugary treats too... especially when allergies and nutrition policies are an issue. 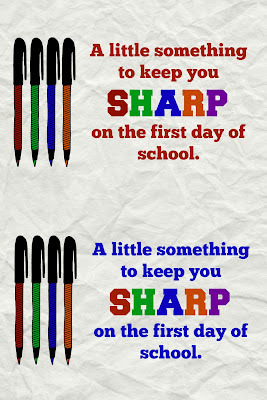 What do you think about sending something small to share with friends on the first day of school? It's definitely not necessary, but it is a fun little tradition that my boys' enjoy. 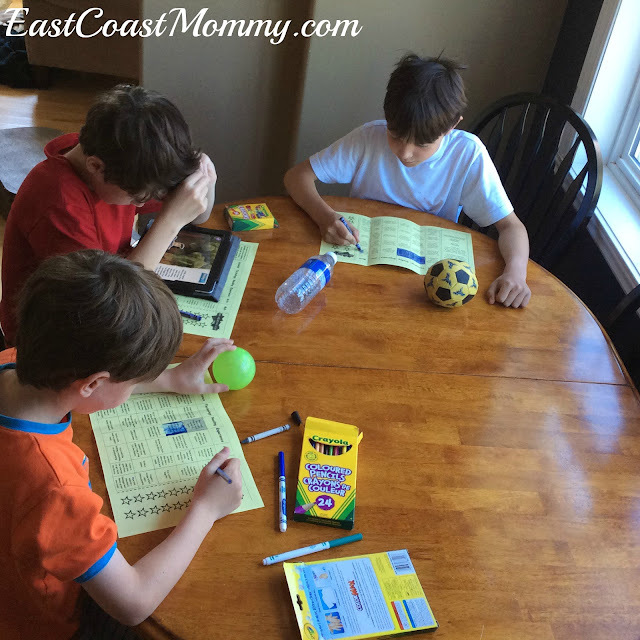 Back to school is a busy time for families, but with a little planning, it can be stress-free and a lot of fun! 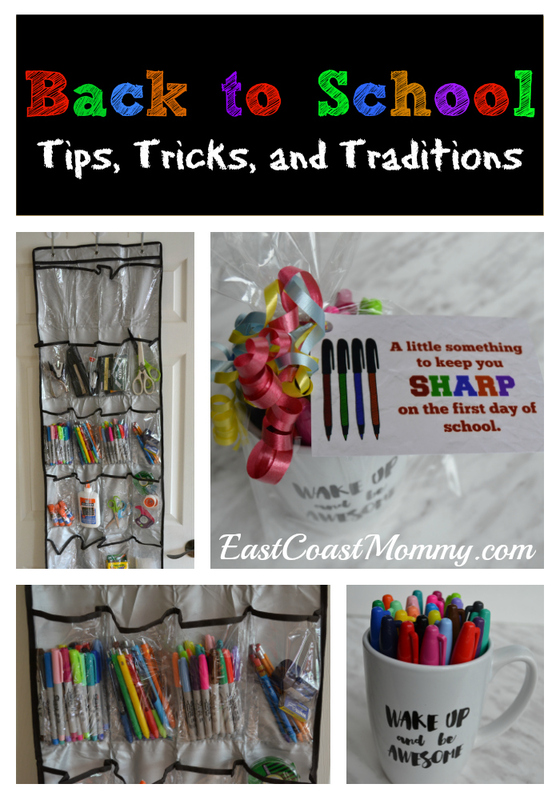 Today, I am sharing some fantastic back to school tips, tricks, and traditions. 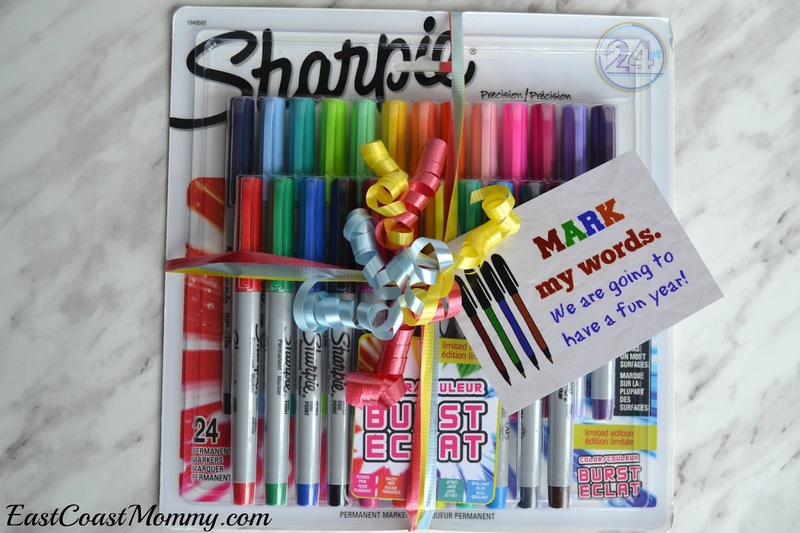 I am also sharing FREE printable gift tags and a fun contest from Sharpie* and Paper Mate*. 1) Shop early, and let the kids pick out their own school supplies. Shopping early will ensure you get everything on your list, and children will be excited to fill their backpacks with their favourite items. Make sure to pick up some Paper Mate Ink Joy gel pens in fabulous colours. (My boys LOVE them!) Also, keep things simple by shopping all in one place. Chances are Walmart* will have everything you need at great prices. 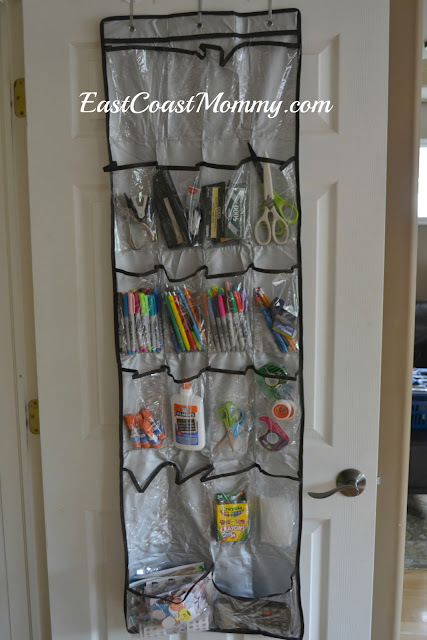 2) Get organized. My secret weapon is this wonderful homework station that hangs on the back of the door leading down to our basement. A clear shoe rack full of school supplies doesn't take up much space and keeps everything handy and easy to find. 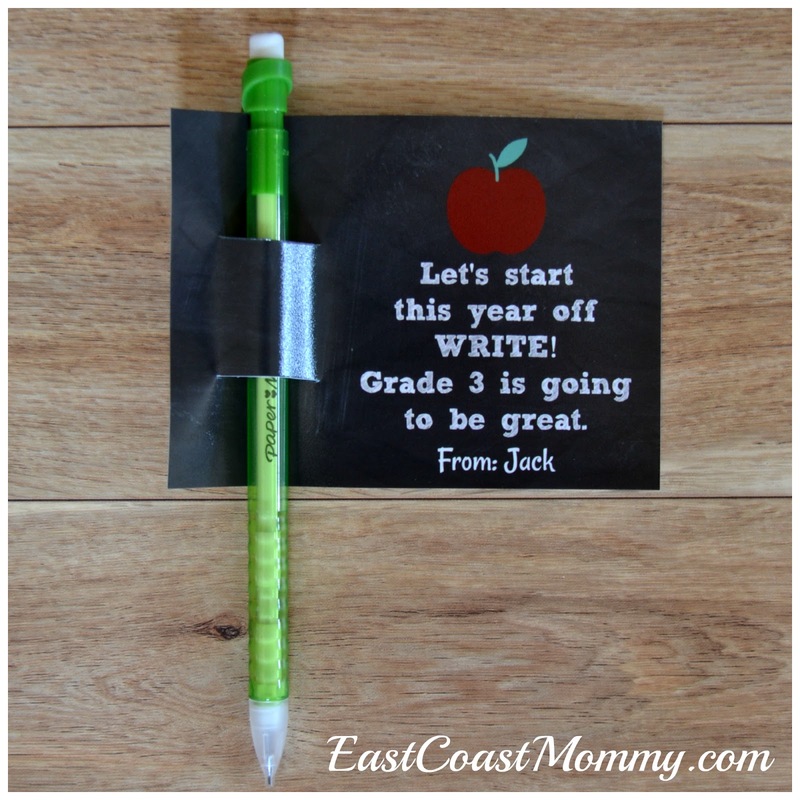 Using colourful pens to make lists and update family calendars is also a great way to keep things organized and fun. 3) Prep for first day of school traditions like: special photos, treats for classmates, and a little gift for the teacher. 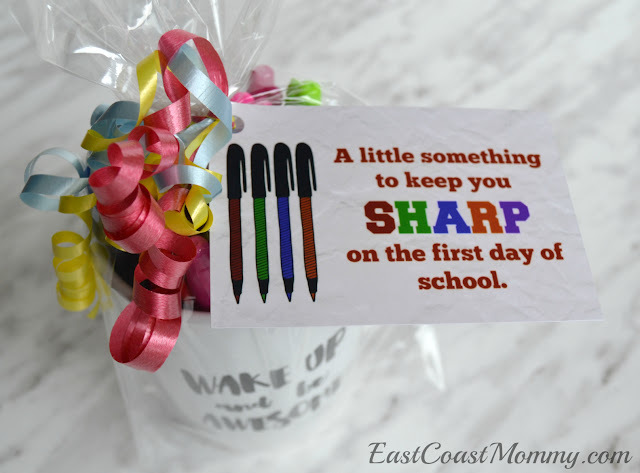 Sharpies in a cup make a perfect first day of school teacher gift. 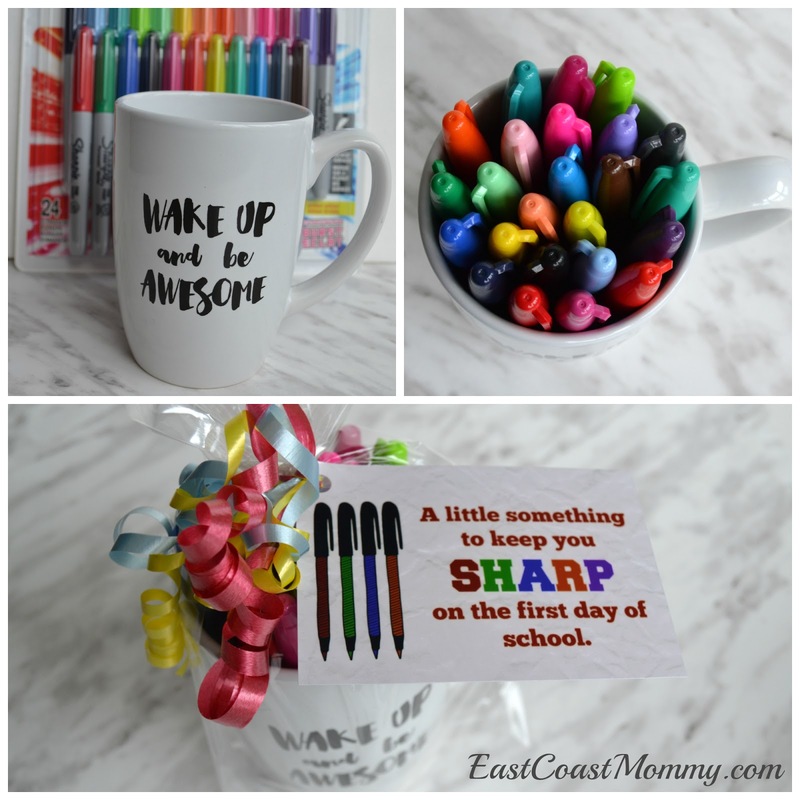 I found this super-cute mug at Walmart, I filled it with assorted Sharpie markers, and I added a fun "A little something to keep you sharp on the first day of school" tag I designed. (24 Sharpie Fine or Sharpie Ultra Fine markers fit perfectly in a mug.) I know my boys' teachers will love these colourful, fade and water resistant markers! You could also forgo the mug, and just attach a tag to a package of markers. Check out the tag I designed that says, "MARK my words. 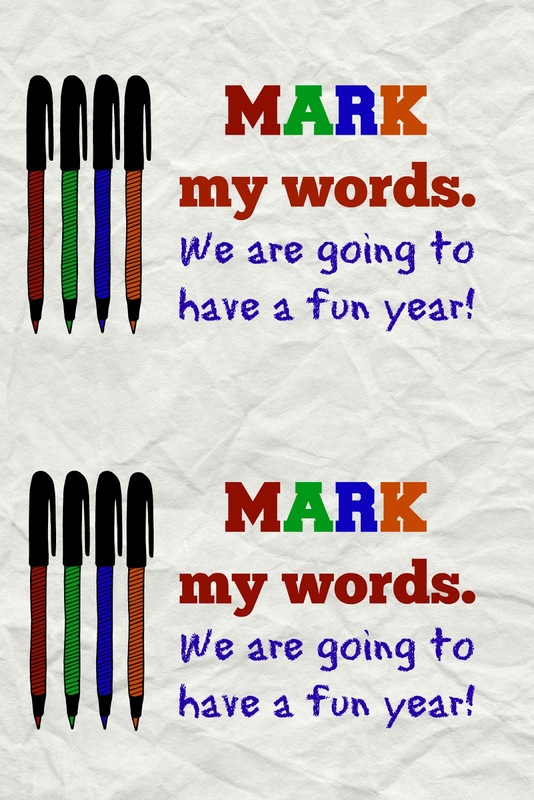 We are going to have a fun year!" Cute, right? To download the tags I designed: right-click on one of the tags below, save it to your computer, and print it like a regular 4X6 photo. I love the idea of kids bringing a gift on the first day of school. 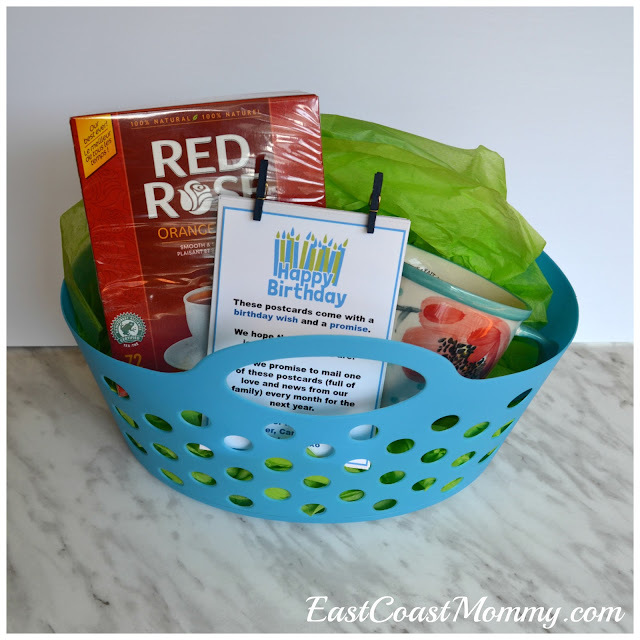 Teachers and students spend a lot of time together, and giving a gift to a new teacher is a nice way to start off the school year. And I know how you might be able to create these fun first day of school gifts for free! Just take a moment to enter a great contest for a chance to win one grand prize of a $250 Walmart gift card and Sharpie & PaperMate gift pack (ARV $315). 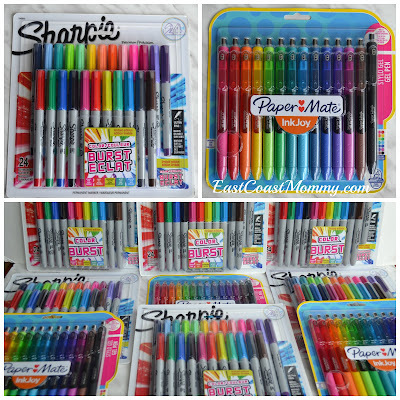 You also have the opportunity to win one of three Sharpie & PaperMate gift packs (ARV $65). 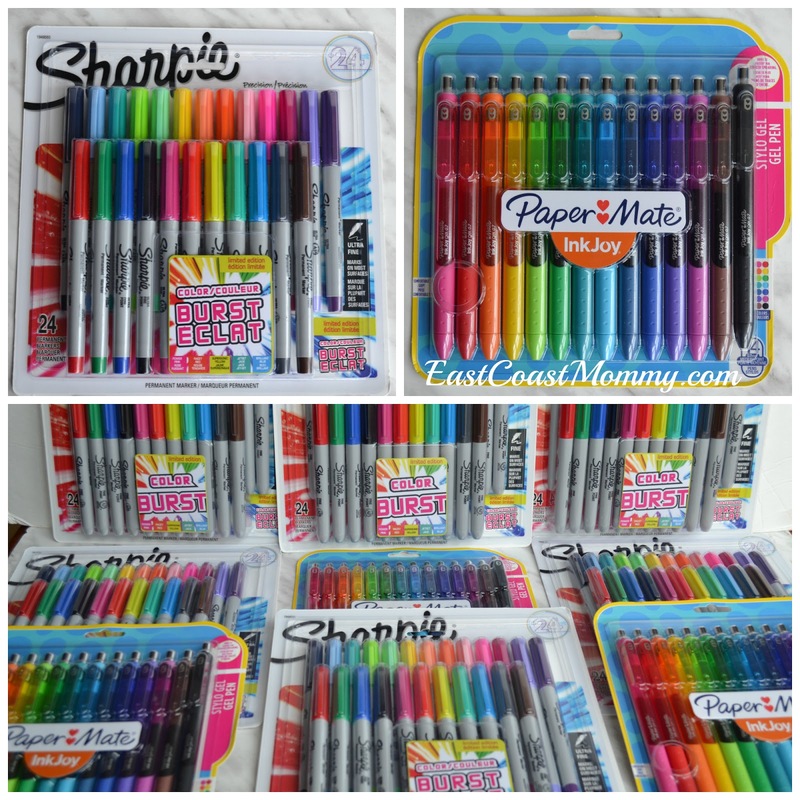 For all the details and a chance to win, check out the Sharpie and PaperMate Back to School Giveaway here. *Disclosure: I have partnered with YMC and Sharpie/Paper Mate and have received compensation for this post. All opinions in the post are my own. 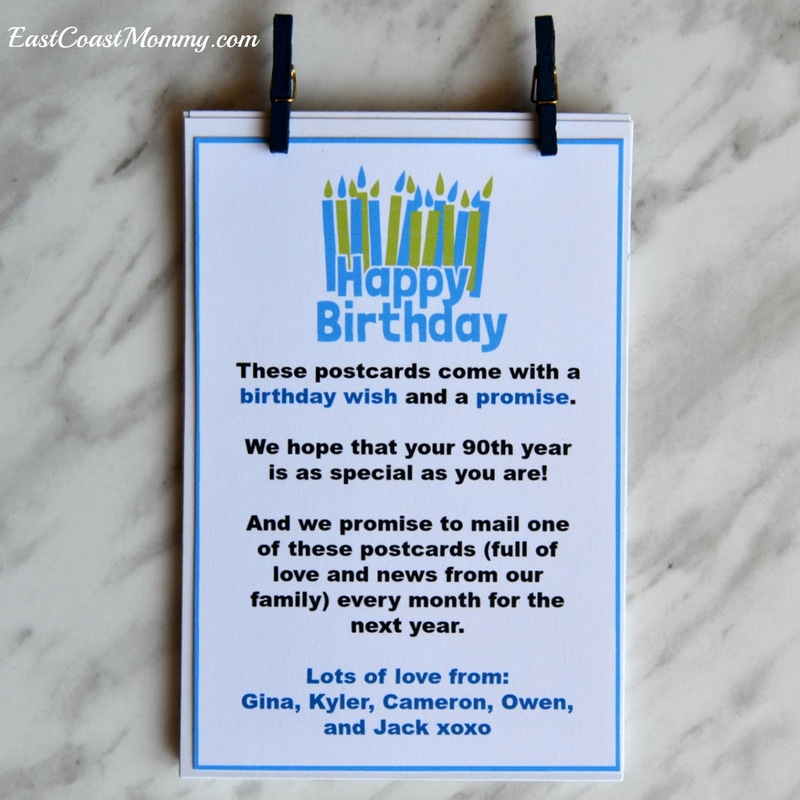 Recently, we had a large family party to celebrate my grandmother's 90th birthday. 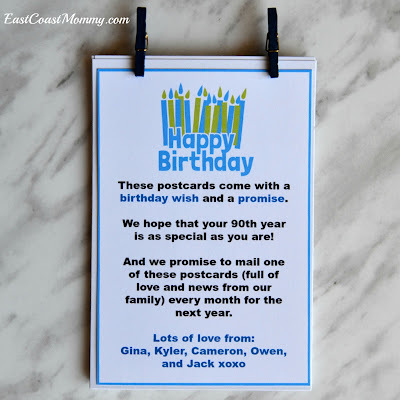 It was a special occasion, and I needed a special gift... but what do you get someone who is 90? 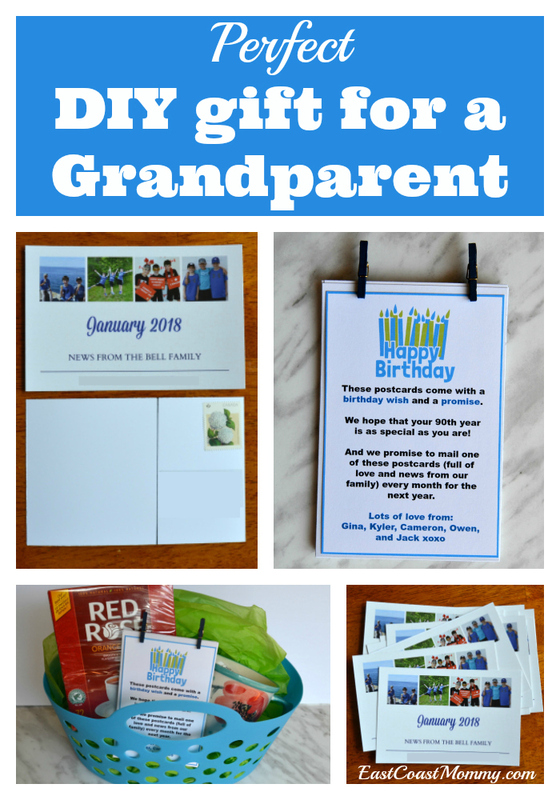 With a little help from my aunt, I came up with this simple and thoughtful DIY grandparent gift. 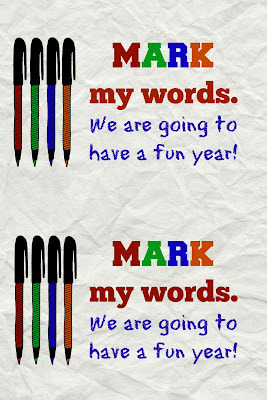 I made this little note (using PicMonkey.com) to explain my gift. 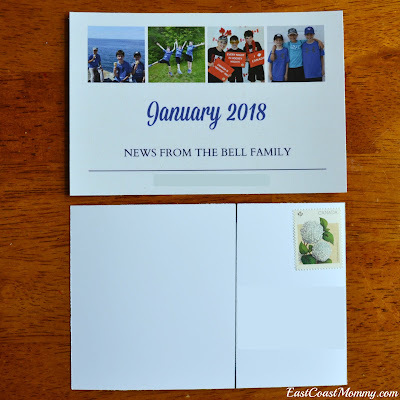 I was giving my grandmother 12 postcards with the promise that I would send one each month for the next year. 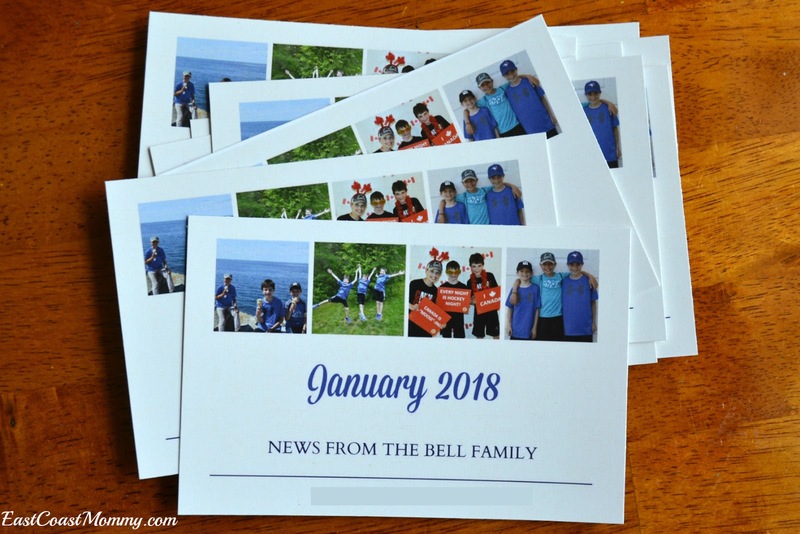 I used Picmonkey to design my postcards, but purchasing postcards would be an easier option. I put my postcards in a basket with some tea and a pretty mug. I think this is the perfect DIY gift for grandparents, don't you? 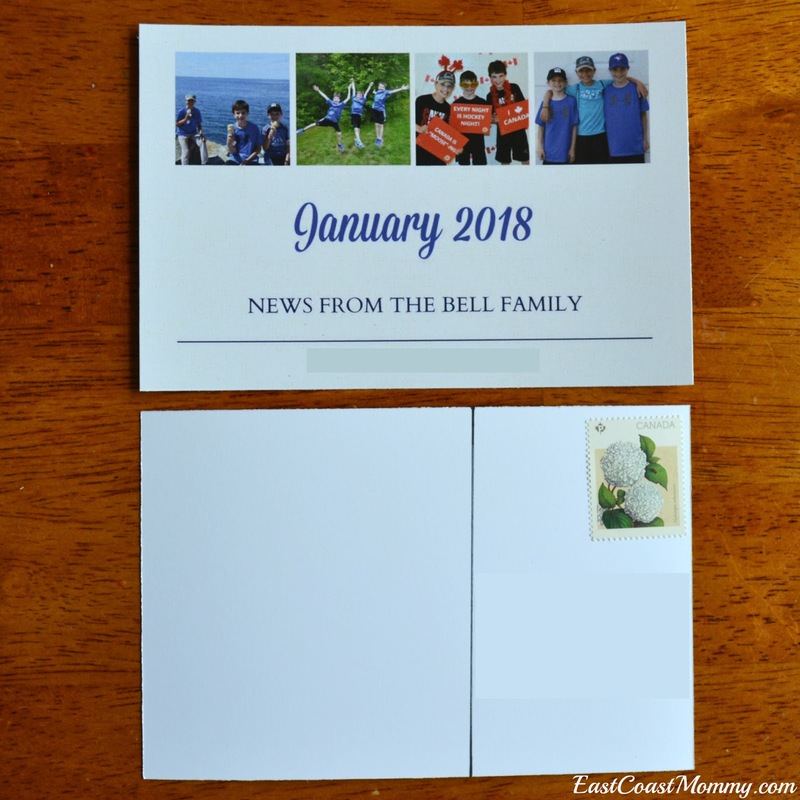 It is guaranteed to bring a year's worth of joy to the recipient! Is there anything better for children than reading? I have always tried to nurture a love of reading in my home, but the summer can be a tough time to get my active boys to sit down with a book. 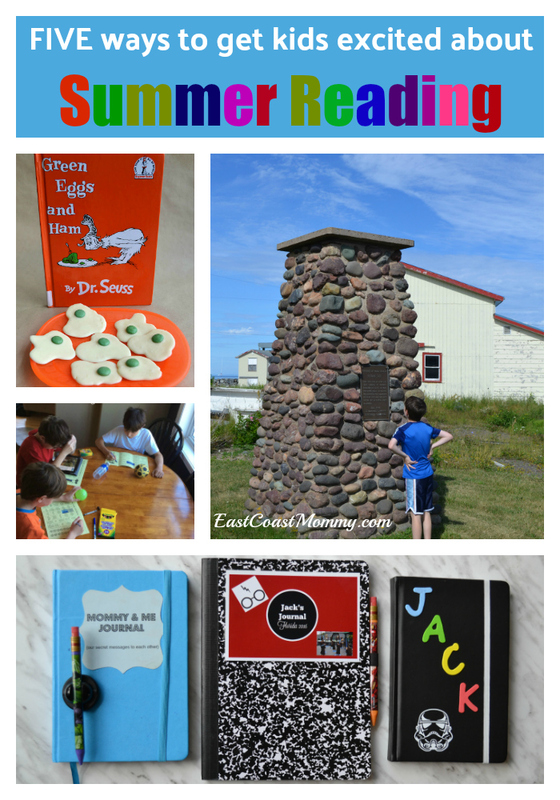 Today, I am sharing 5 ways that I get my boys excited about summer reading. Reading doesn't have to be a chore; it can be a source of summer fun! 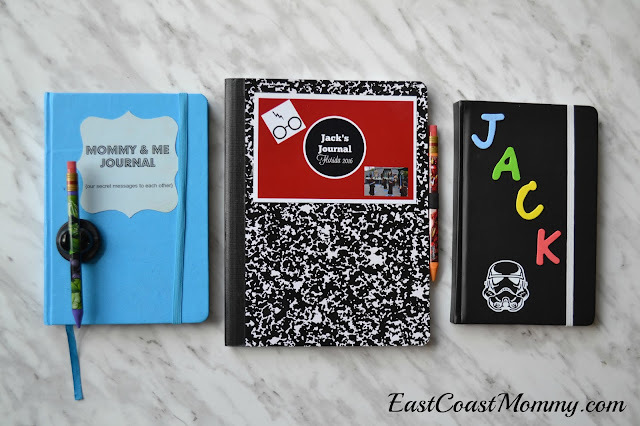 1) Make a journal - Reading and writing can be fun for kids when they have a colourful, customized journal. A "Mom and Me" or "Dad and Me" journal is a wonderful way for kids and parents to write notes to each other all summer. Diaries and travel journals are also fantastic. My boys like to write in their journals when they climb into bed at the end of the day. 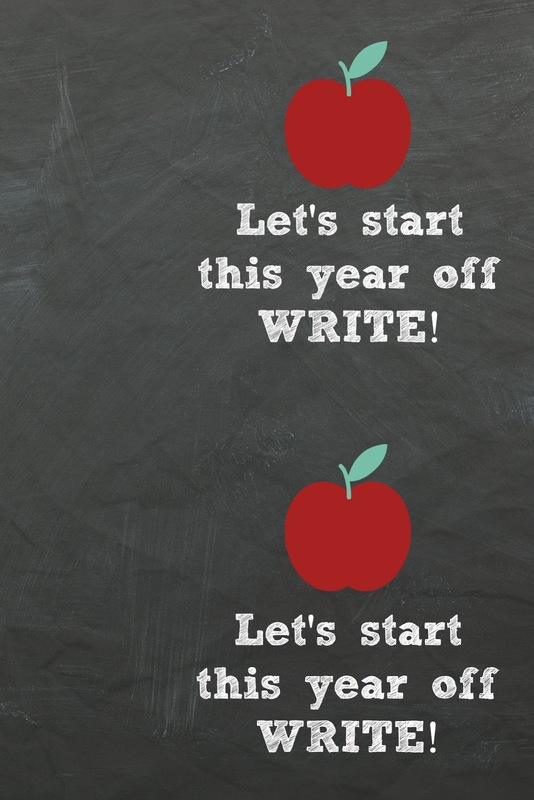 3) Make a summer reading list - Making a list of books to read can be a great way to get kids excited about reading. 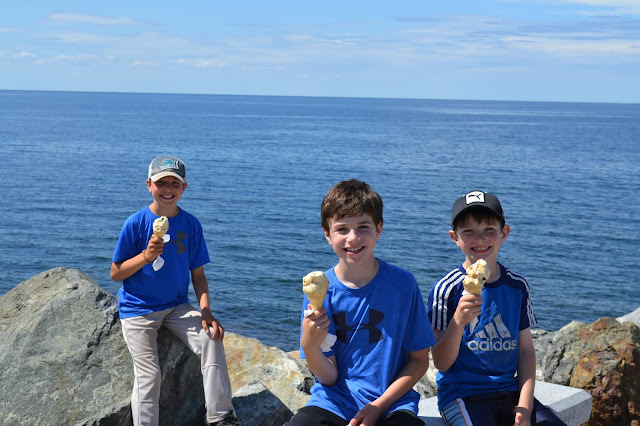 Kids can set goals and maybe even earn a reward (like a trip to the an ice cream stand) for completing their list. If kids need help getting started, you can check out the TD Summer Reading Club suggestions here. 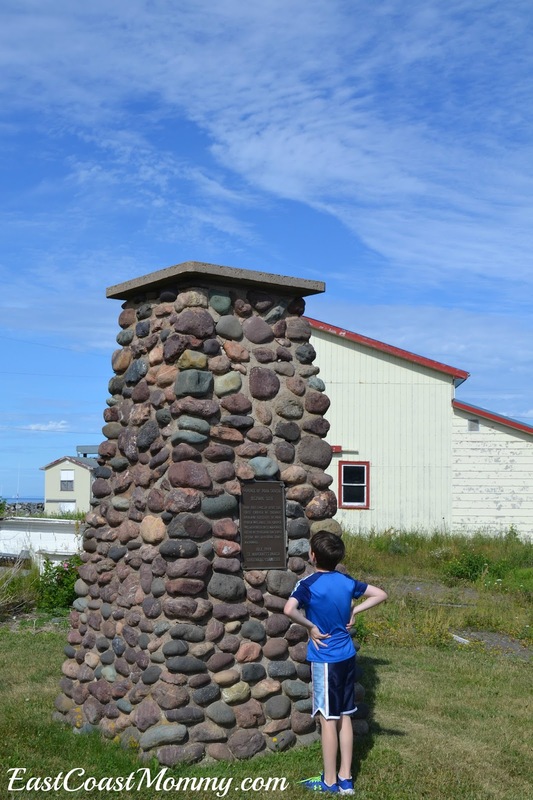 4) Take it outside - The summer is the perfect time to get outside and read. Read signs on a road trip, read in a tent, read at the park, read at the beach, etc... Challenging the kids to read in 5 different places will help to keep them motivated! 5) Host a summer reading party - Share the love of reading with friends in your community. 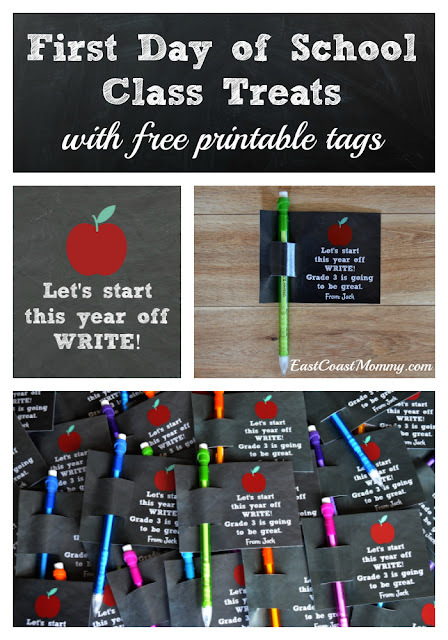 Have a book swap, make bookmarks, and enjoy a special book-themed snack. 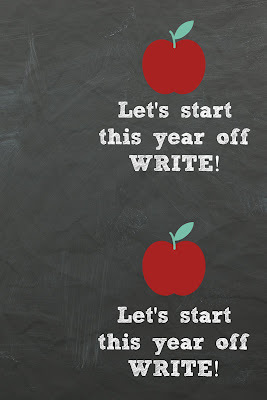 If you are struggling to get the kids reading this summer, I hope you try some of my simple ideas. And don't forget to check out the TD Summer Reading Club*. It makes it easy for kids to keep reading all summer long by connecting families with books, inspiring a sense of play through reading, building confidence and celebrating accomplishments. *Disclosure: I have partnered with YMC and TD Summer Reading Club and have received compensation for this post. All opinions in the post are my own.